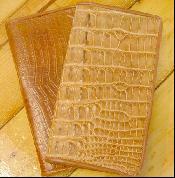 Both of these shiny alligator billfolds contain window pockets for easy licence or identification placement. Pastel simple check cover with two compartments for checks and reconcile. For the man who still wears a suit or sport coat. Slim brest fold. Shiny alligator check book with multiple pockets and a zip section. Address and wallet in one. Sections for your credit cards and bills. With a zip closure change compartment and multiple pockets and dividers this mini secretary is very practical. The dorsal fin stripe continues all of the way around this one. Featuring multi pockets and windows. A great way to keep your currency together.